Roughly once a year I seem to come across a book that is utterly perfect and that I can’t stop talking about and recommending, often these seem to be books ostensibly published for children or young adults but that are so sublime they cross all boundaries. Last year that book was Sally Nicholl’s Things a Bright Girl Can Do and this year the book is The Skylark’s War by Hilary McKay. I was lucky enough to receive an advance copy of this book from Macmillan and I found myself totally unable to put the book down – I know that this is said a lot about books but I promise that in this case it is the absolute truth, I spent about 10 hours devouring this book from cover to cover on a recent Sunday. It is a family book that covers roughly the first quarter of the twentieth century and touches on many of the social and political issues of the time but without ever being didactic or preachy. Our main characters are a brother and sister who live in almost neglect for various reasons, this goes mostly under the radar however because they are from a family of class with money. The two are not the archetypal children who have adventures because they are orphans but the lack of parental support does allow them a lot of freedom in their home life plus idyllic summer holidays with grandparents by the seaside give a (mostly) bright spot in their lives. As the story unfolds more characters are introduced to the plot – a cousin, and then another set of siblings met through school as well as a few adult mentor figures. All of these characters are as alive as Clarry and Peter and are people in their own right not mere ciphers or plot devices. The story moves sedately through the years (echoing the tedium of the siblings’ lives) until everything everywhere changes when war breaks out and then how it changes again with peace. I am trying to keep this description vague because I hope that as others read this book they will fall in love with Clarry and Peter just as I did. Although I have been immersed in all things WW1 for the past few years I did learn some new things from this book and while I did find one tiny plot strand a little bit stretched the rest of it was sublime and managed to get across a feel of both the Front and Home Front really well. Clarry’s fight to be educated was also a strong theme through this book and in 2018 when we are commemorating both the end of WW1 and (some) women gaining the vote and stepping towards equality this was great to read. 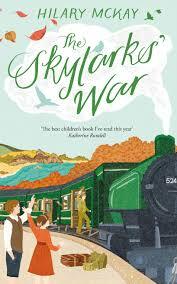 This is a children’s book and as such isn’t as ‘full on’ about the war as people like Pat Barker write but I found the story to stand up to being read by an adult and I think that it will be a great read for different generations to share – I know that I’ll be recommending it to everyone. You can reserve your copy on the Norfolk Library catalogue now, and the book was published yesterday (20th September 2018). 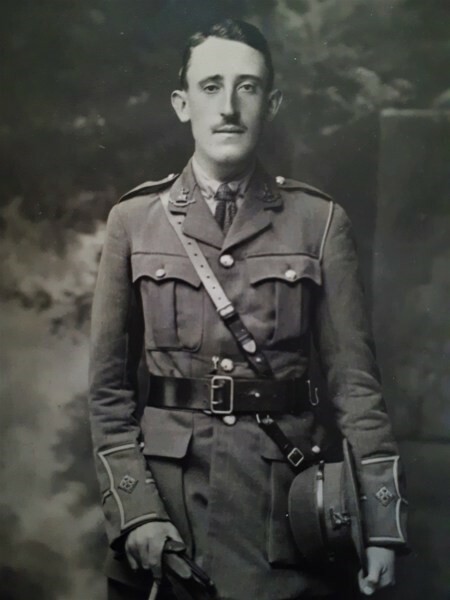 Here at the Norfolkinworldwar1 blog we were recently contacted by Mr King-Seguin who let us know about the research he and other family members were undertaking about their Grandfather, who came from Canada yet still served with the Norfolk Regiment. Below is a short introduction from William John Grummett’s grandson (Mr. Snell) and a link to the website showcasing all of their fascinating research. The First World War through the Lens of William J. Grummett, 2nd Lieutenant, Norfolk Regiment: A Soldier’s Story. 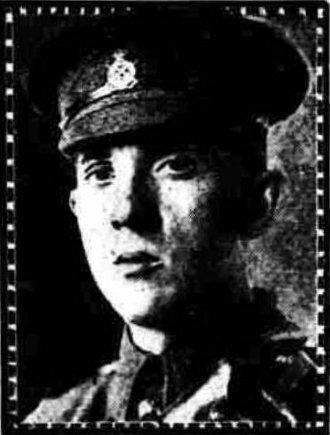 William John Grummett (1891-1967) was a young law student living in Canada when the First World War began in 1914. Honouring a promise made to his parents, he held off enlisting until 1915 and the formation of the second Canadian contingent of soldiers preparing for war in Europe. Like most young men who signed up to go to war, he was off on the “adventure of a lifetime”. As it turns out, his journey went much farther than most: to the foothills of the Himalaya Mountains and the headwaters of the sacred Ganges River, to the sun blasted deserts of Mesopotamia and the twin rivers, Tigris and Euphrates that had held between them the very cradle of civilization. He travelled more than 24,000 nautical miles, 4500 miles by train and countless miles on horseback and on foot. And, he took photographs documenting the events, places and most remarkably, the people: children, parents, fellow soldiers, street performers, holy men, the devout, herdsmen and refugees, as the journey unfolded. As ever if you have a family story to share please get in touch – we are very keen to make sure that these stories are not forgotten. I work as a Library & Information Assistant at Sheringham Library. 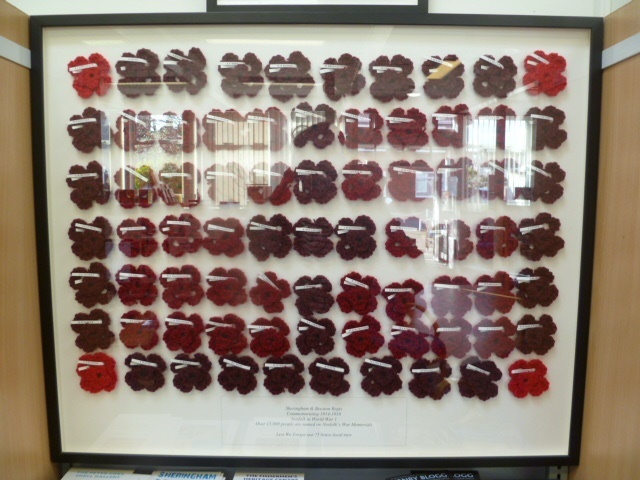 In June 2017, a poster arrived for display in the Library asking people to make poppies for the Norfolk in WW1 Project. My grandad had lost his father and his brother in this war, so I decided to make a few poppies. 300 crochet’d poppies later, I turned my attention to Sheringham, where I have lived for 17 years. Sheringham & Beeston Regis lost 75 men in WW1 and Upper Sheringham lost 8. I crochet’d 83 poppies and with the help of the Imperial War Museum, the Royal British Legion and Roll of Honour.com. I was able to individually dedicate each poppy with the “fallen” man’s name, typed onto a label and threaded through the poppy. 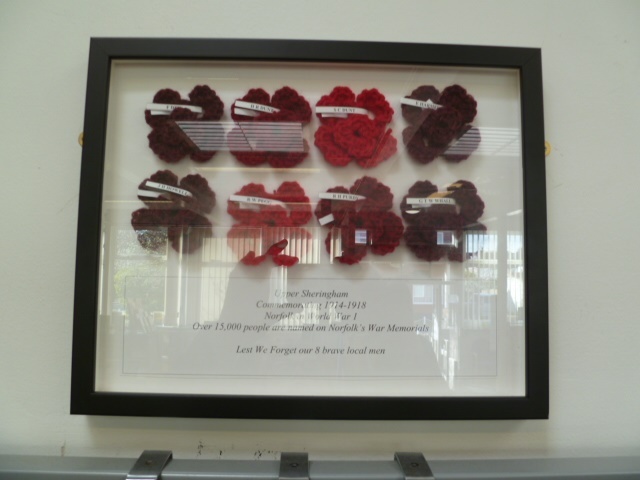 The poppies have been framed and are on permanent display in Sheringham Library. Alex’s 300+ poppies have already been strung together ready for display in the autumn, but do pop into Sheringham Library to see these wonderful, named poppies.